Sketches, preliminary studies, drawings, and network analysis diagram for Fun Palace juxtaposed in one image. It has been a recurring theme in this column, we are neither the first nor the last to claim that computational design does not necessarily require computers. An overseer is involved in setting up the intricate parameters, either analogue or digital. Just like in a mathematical function, the parameters are fixed as they are the coefficients. They regulate the relations in between parts. The variables (x, y, etc. ), as the name suggests, are the unknown as they can be in total flux as long as they comply with the overseer’s function. Although the variables change according to different scenarios and the results might look as if they are totally independent from one another, as the multitude of outcomes are all driven from the same equation they actually share the same bonds. In the previous issue, we had introduced architects employing analog computational methods to replicate results in different scales or to construct analog machines to calculate sophisticated structures. Their approach to design was revolutionary, yet they were all utilizing functions that were already well defined. We had finished the column with a simple yet intriguing question pondering how the digital realm should contribute to computational methodology in architecture. It is the perfect time to explore this mutualist affiliation. However, it is futile to search for a pure interaction between computational design for architecture and the digital realm in the post-computerization of architectural tools (circa late ‘80s onwards) as the overwhelming majority of architects have opted to enslave computers to carry out exceedingly simple tasks to solely display whatever the user has input. Thus, we will focus on the era between 1960 and 1980 – an epoch that could have redefined architectural design as we know. A City is not a Tree – nor a semi lattice to be honest. It is a little ironic that an architect influenced a great majority of the computer programming languages of today, considering the sorrowful state of the majority of computer programs for architectural design. Christopher Alexander’s A Pattern Language: Towns, Buildings, Construction have influenced design patterns, reusable form of a solution to a design problem, in the field of computer science. Nature of Order has great importance for object oriented programming languages. Notes on the Synthesis of Form had been a reading material for computer science researchers in 1960s. Whereas the interpretation of Alexander’s works in the field of computer science have been pioneering, literal architectural adaptations of Alexander’s works (especially adaptations inspired from Patterns) have remained mediocre at best. Apparently as architects, we do not excel at abstraction. Possibly, it is due to the lack of mathematical foundation. Maybe we should investigate how Alexander has actually arrived to the ideas in Patterns. Alexander situated architecture as a problem to be solved with heuristics and computational models, as he had a degree in mathematics and architecture from the University of Cambridge. In his postgraduate program, he worked in multidisciplinary groups with cognitive psychologists, computers scientists as well as people with backgrounds in cybernetics and artificial intelligence. 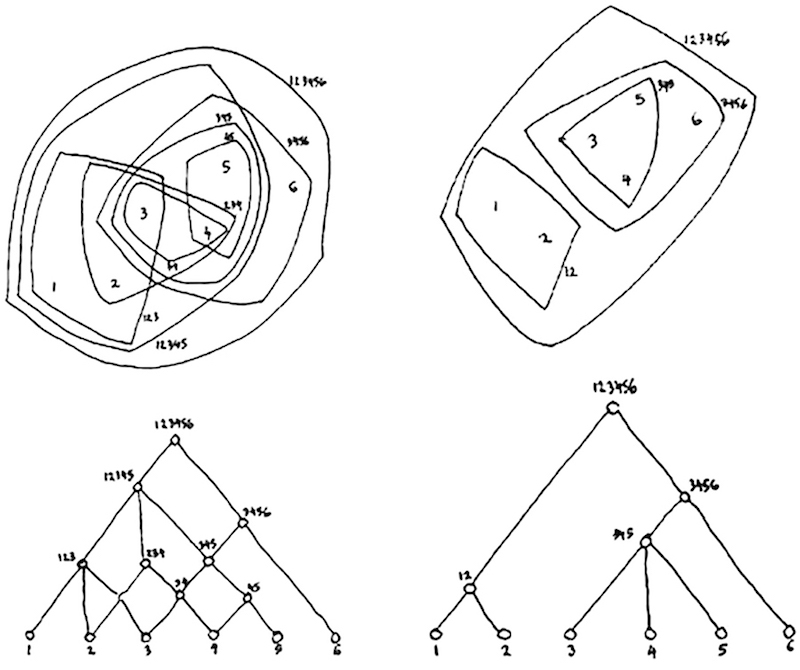 Even though his intention was to address the very nature of order, he had severe technological limitations forcing his theories – when his program could only format limited points of connections, Alexander argued all design problems were hierarchical trees with a top-down structure. When his program could format multiple points of connection, all of a sudden all design problems became semi lattices with crisscrossed relations.¹ When all was structured openly with many possible connections, design problems became a network. Alexander theorized that problems were arising from conflicting forces, and patterns could provide a set of values to guide designers towards a decision based on the particular application. Patterns is meant to be just a guidebook with concrete examples to showcase how to utilize design patterns – architects should be defining their own patterns, not take his sample patterns literally. Whereas Alexander focused excessively on the heuristic side of computing information, Cedric Price concentrated on designs that were embodied through the flow of information. His works were composed of cybernetic feedback loops between the designer, building, the site and the user which would learn and respond in time. He was the first to conceive a truly interactive setup, advocating a degree of indeterminacy in an ever-continuous generative designmaking process. Johan Huizinga’s Homo Ludens and James Carse’s Infinite Game resonate deeply in Price’s works as the act of playing a game requires an intelligent engagement – and for people interested in artificial intelligence or heuristics, games have always been a curious subject. Section of Fun Palace, the information flows through the building. Price’s infamous Fun Palace is a framework that can be reconfigured based to its users’ actions, supporting different sorts of fun. The designer merely provides a broad system which support openness and indeterminacy to foster unforeseen happenings of actions through varied processing of information. Fun Palace had a huge impact on modern architecture, as it had a direct influence on the design of Centre Georges Pompidou by Renzo Piano and Richard Rogers. Rather than the striking resemblances of the structure or the section, it is how Piano and Rogers had envisioned Pompidou to be originally – full of information screens and a vast empty hall at the ground floor, that parallels Price’s Fun Palace. Residents of the SEEK, the gerbils. Alexander, Price and Negroponte tapped into fields which might seem irrelevant with architecture at first; cybernetics, artificial intelligence, heuristics and computer science in particular. For them, architecture itself was a process rather than a definitive end result. They perceived architecture as a generative design process based on the designer and the design task at hand. Thus, even though they were all trained as architects, they all claimed to be anti-architects at one point in their lives as they functioned in total opposition to the profession with the worst track record of keeping up to date with technological advancements. Perhaps, anti-architecture is much more fun and provides much more valuable lessons. Architecture Machine Group (ArchMac) later merged with other research groups of MIT and formed the MIT Media Lab, with Negroponte serving as its director for 15 years, and is the Chairman Emeritus. 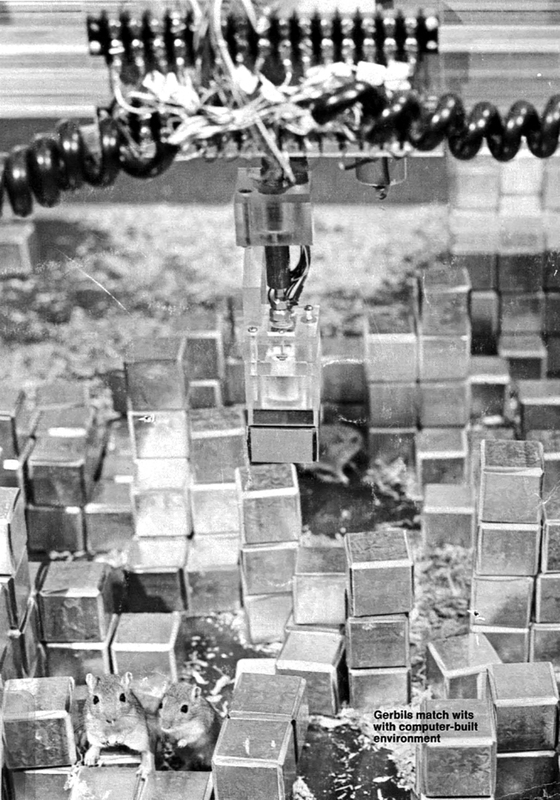 Negroponte, N. (1975) Soft Architecture Machines. MIT Press, Cambridge. Architecture Machine Group, “Computer Aids to Participatory Architecture”, Preface. In a 1984 TED Talk, you can see Negroponte showcasing a touchscreen interface developed through DARPA funding.